I always find it challenging to decorate my home after Christmas. I’m an over-decorator at Christmas time, setting up four trees and decorating nearly every corner of my home but once I un-decorate shortly after the holidays, I feel my home is so bare. It’s not quite ready to say, “hey I’m ready for Spring” nor do I want it screaming “Valentines.” I personally find it challenging. 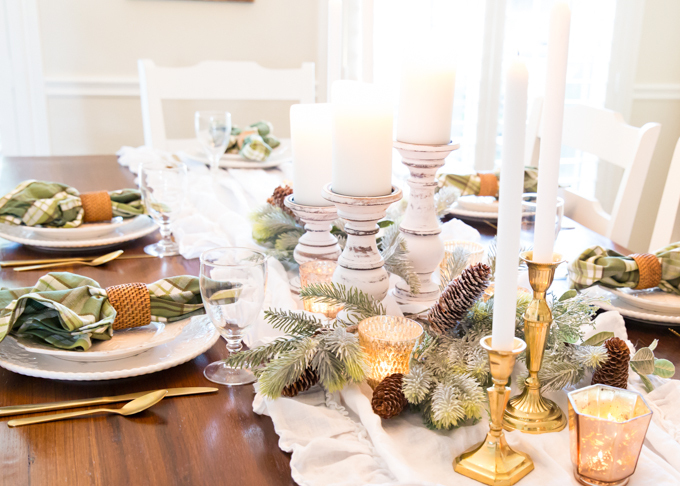 However, this year, I’m seeing a lot of bloggers with “winter decor.” While I didn’t keep winter decor throughout my home, I did recently enjoy setting up a Winter Tablescape! 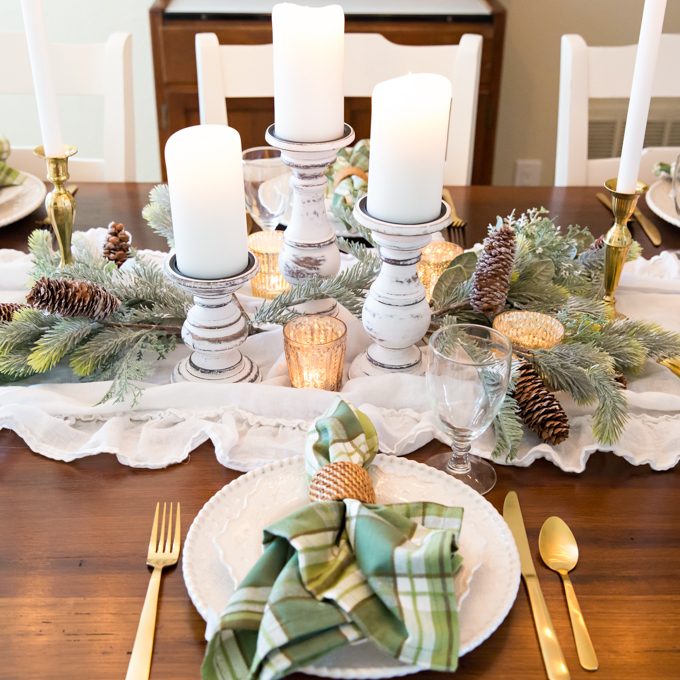 I loved using just a bit of greenery and mixing it with different shades of greens and golds. I decided against using chargers or placemats and tried to keep it simple enough for everyday, but just enough that you could throw a simple dinner party! I love all the candles, but I’d suggest against using tapers if there will be little ones around. I don’t know what it is about candles, but little ones love to blow them out! I know I wouldn’t want them leaning over open flame tapers! The white pillar holders are new from Wayfair and were priced very reasonable for a set of three. I’ve had the gold taper holders for years and the votive holders were used at my daughter’s wedding two years ago. The greenery are two stems that I picked up after Christmas at Michaels Craft Store (I think they were 60 or 70% off). 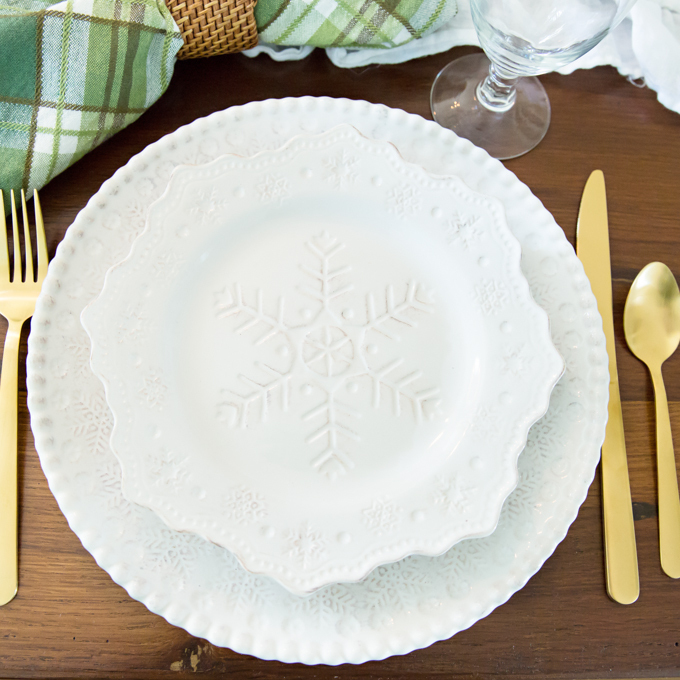 I’m in love with the Pier 1 Snowflake Plates! I plan to use them every year as soon as Thanksgiving is over right on up to mid February. 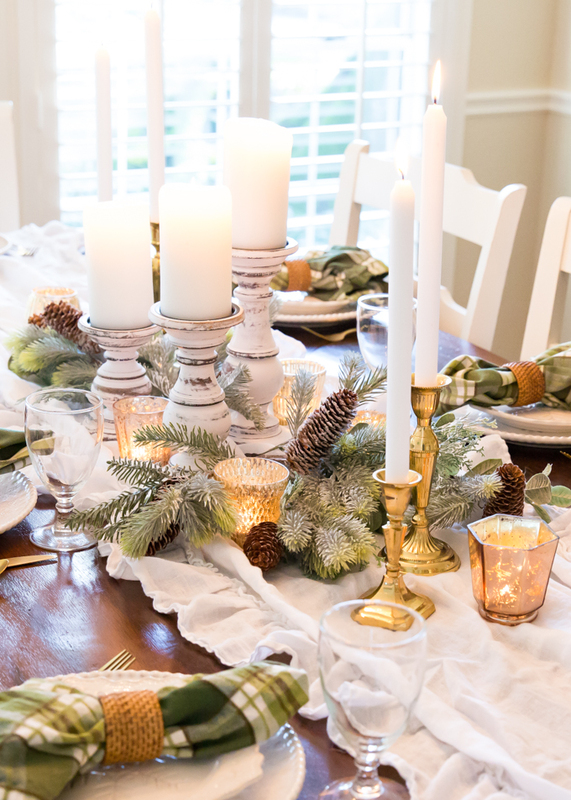 They’re perfect for a Winter Tablescape! My goal when setting my dining room table is to make it festive and pretty, but I don’t ever want it to be complicated or overly fussy. 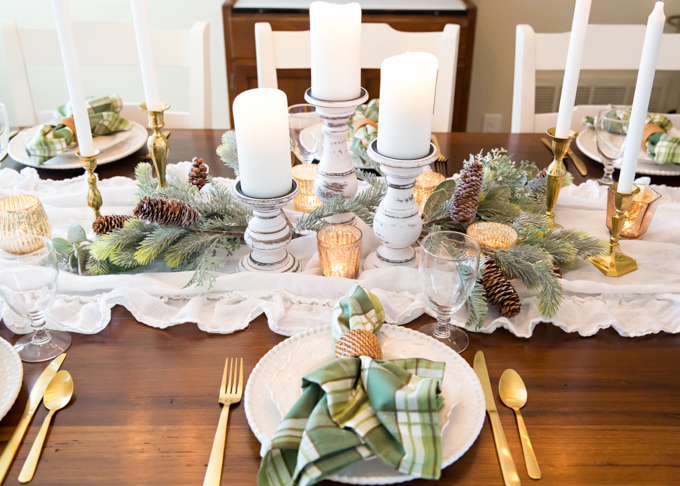 I think I accomplished that with this Winter Tablescape. 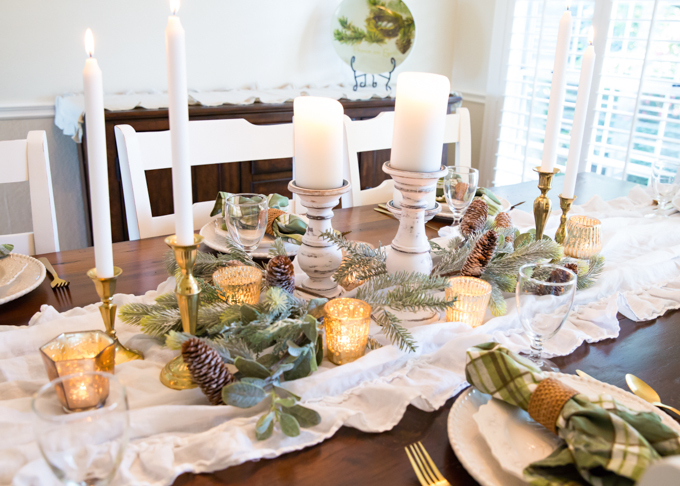 The centerpiece is simply a runner, two greenery picks, and an assortment of candle. 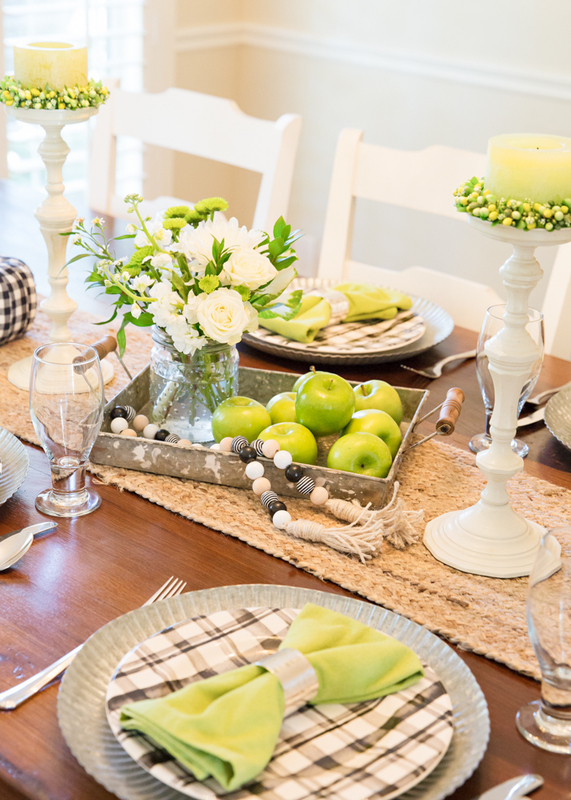 Add in the essentials: plates, glasses, silverware, and napkins and voila’…. 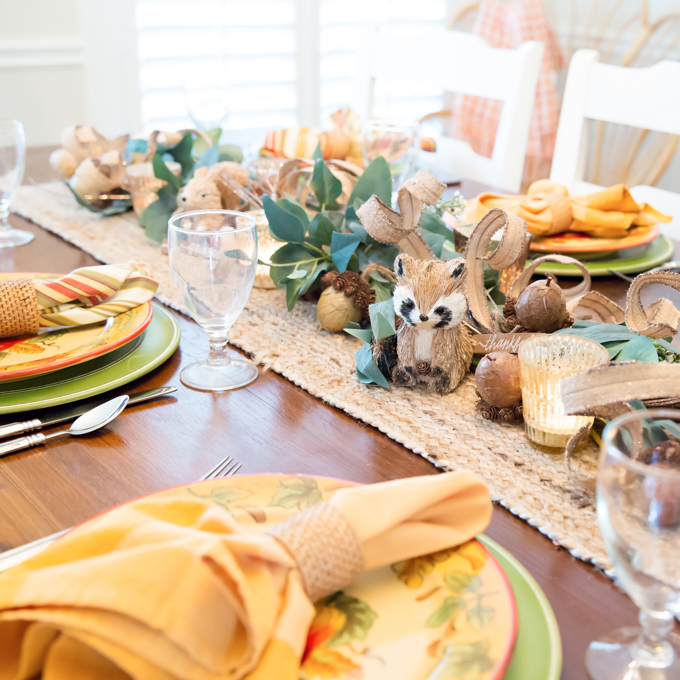 A tablescape that is simple yet pretty, and not overly fussy. 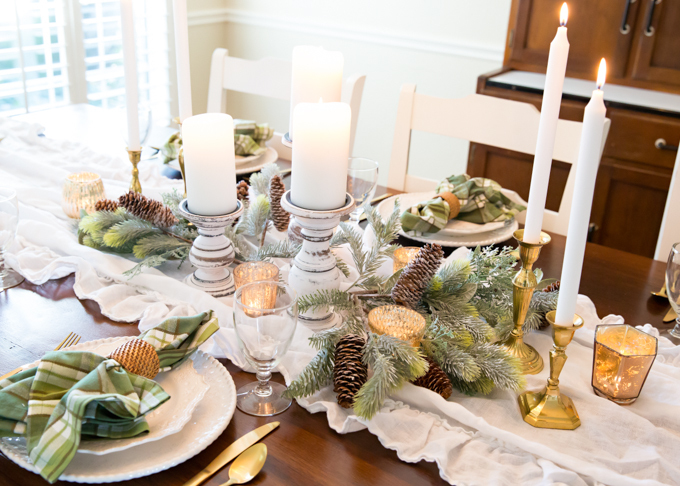 If you love this Winter Tablescape, please make sure and Pin It onto your favorite Pinterest Board (or share on FB). I can’t believe I did this, but somewhere in the craziness of Christmas I misplaced my camera’s memory card with my Christmas tablescapes on it. 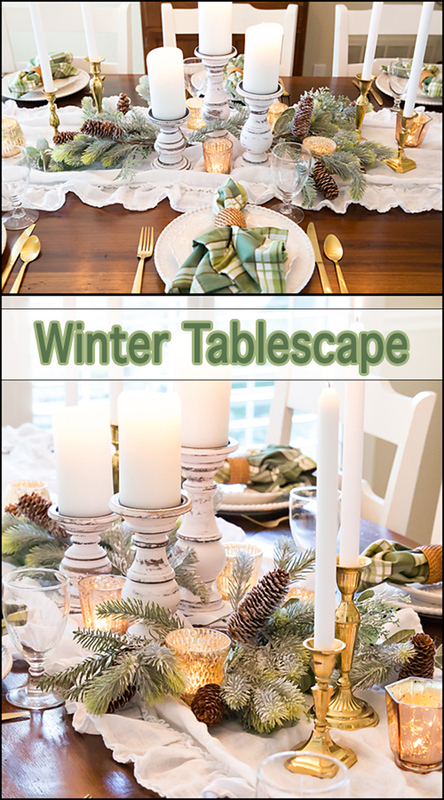 I have some images on my phone that I’ll edit soon and I’ll share a few of those, but in the meantime, I hope you enjoy and get some tablescape ideas from this Winter Tablescape along with these fall tables. 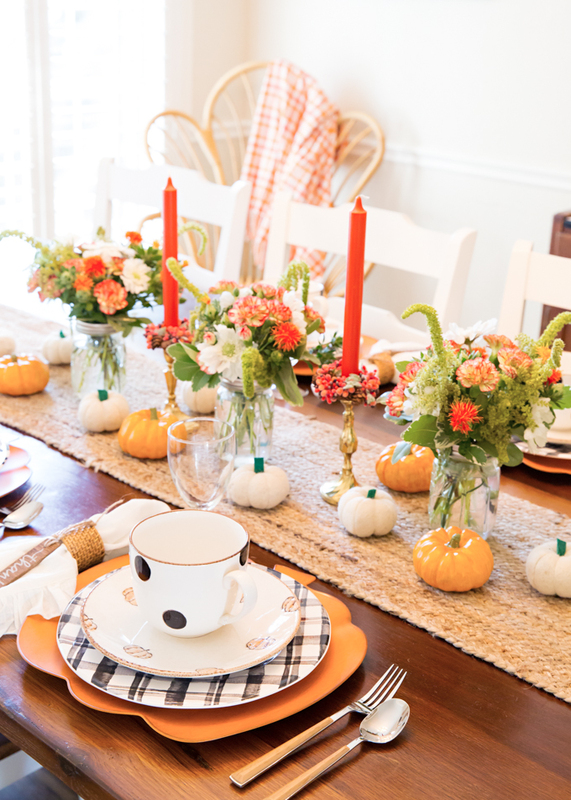 And look how fun and simple this early Fall Apple Tablescape is! !